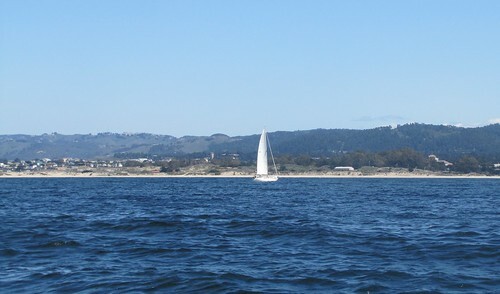 , Point Lobos and Elkhorn Slough along the Monterey Bay National Marine Sanctuary. Having only been on the open seas for four months it is no wonder why this unique attraction is one of the hottest tickets in town! 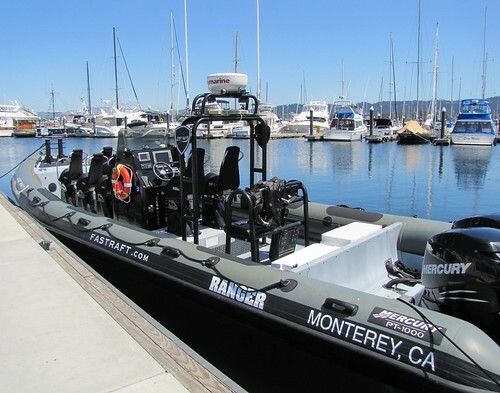 Fast Raft offers a variety of tours from a one hour “Mid-Day Sea-esta” to a two and half hour “Afternoon Delight.” Having a queasy stomach I figured the one hour tour would be just fine to start. 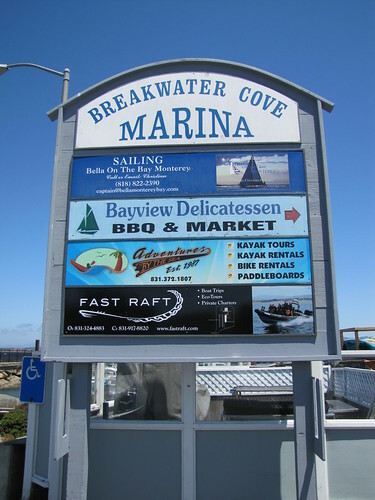 The tour began at the Coast Guard Pier in Monterey, near the Massaro and Santos restaurant. Captain Laurence Henry was waiting for our crew when we arrived and were whisked away to be fitted for optional “weatherproof” accessories. Once we were geared up it was time to head down to the dock. Capitan Henry gave a little run-down on the magnificent PT1000 vessel which is the only one of its kind owned by a civilian in the country. 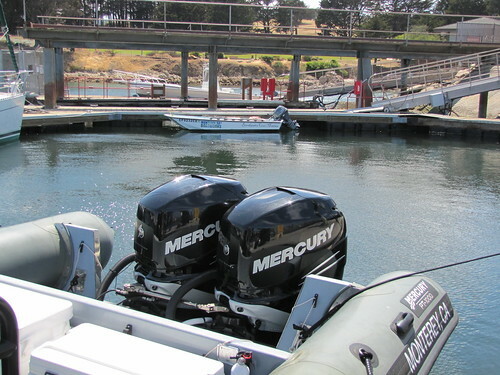 The “Ranger” was originally designed for military use and its fiberglass hull and inflatable pontoons enable it to maneuver at high speeds, although I suppose the two Mercury engines don’t hurt. The six seats on-board were a bit intimidating at first as they resembled something off of a crazy roller coaster ride at Great America. The suspension seats were actually crafted in Sweden and allow for a much more pleasant experience on the bay, especially when encountering turbulence. Once we were buckled up, with the most comfortable lift jackets I have ever worn, it was time to take to our seats. The chairs were super bouncy and so much fun; the smooth suspension made it feel as though you were riding a toy pony. Captain Henry started the engines and we slowly made our approach out of the harbor and out onto the open sea. 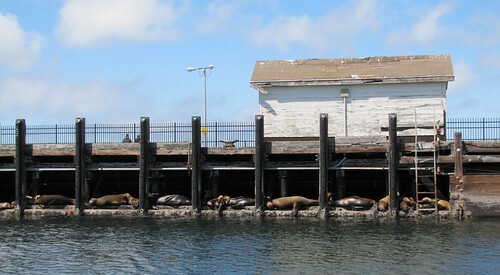 As we leisurely passed by the row of sea lions and migratory birds I was anticipating what this raft could really do. After we were in the clear Captain Henry revved it up and we were off! 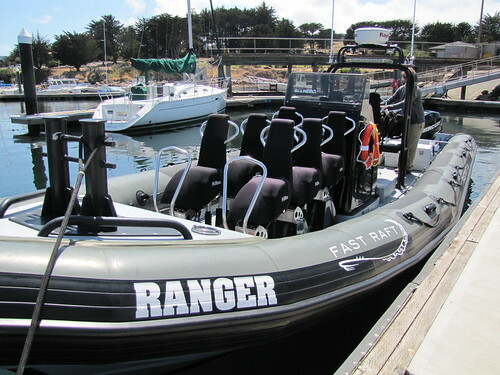 The Ranger can go up to 50-60 mph which really feels like 100 mph on the ocean. We were bouncing off of white caps and whipping around turns like champs; luckily we couldn’t feel a thing thanks to the comfy shock-absorbing seats! 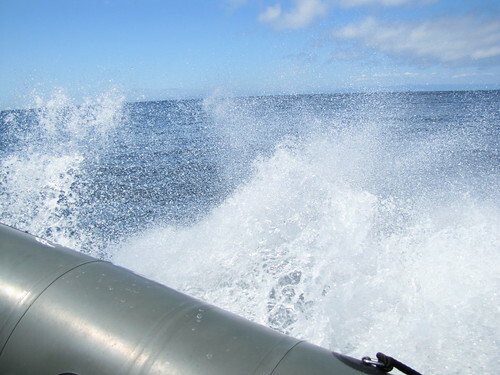 An adrenaline junkie crew member of ours found a way to really enjoy the open sea. He strapped himself down with the seat belt and stood up with arms open wide during the ride. I was just waiting for him to holler “I’m king of the world!” What was really surprising was how quiet the Fast Raft was on the bay. You would think the two engines would wreak havoc on the eardrums but we could still easily hear Captain Henry’s interesting tidbits about the nearby sights. 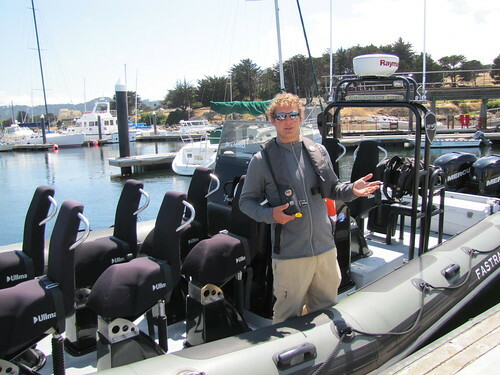 Captain Henry’s passion and background in protecting the marine sanctuary and its species was evident throughout the tour. 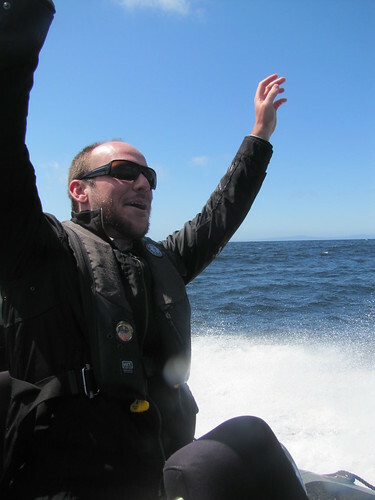 He was quick to point out all of the wildlife we encountered including sea otters, harbor seals and sea lions. 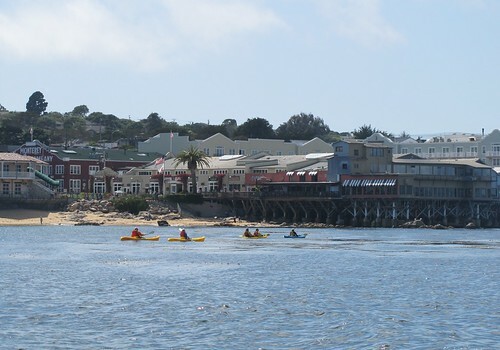 Speeding along the shores of Cannery Row was a treat; I can only imagine what visitors on the row were thinking about our unique pontoon. 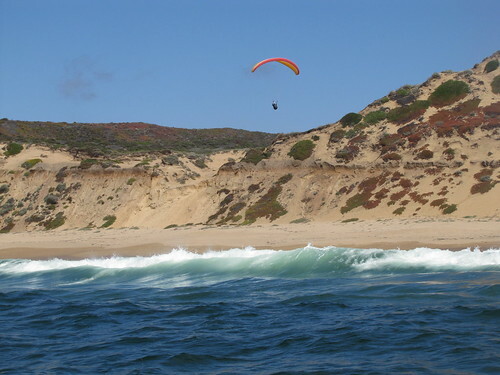 After gallivanting around Cannery Row and Lover’s Point we headed towards Marina State Beach where there were several hang gliders out and about. 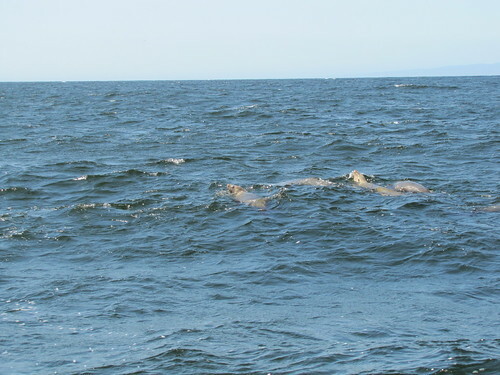 It was amazing to see these guys in action with views from the bay rather than the beach. The one hour tour flew by without a hint of queasiness. 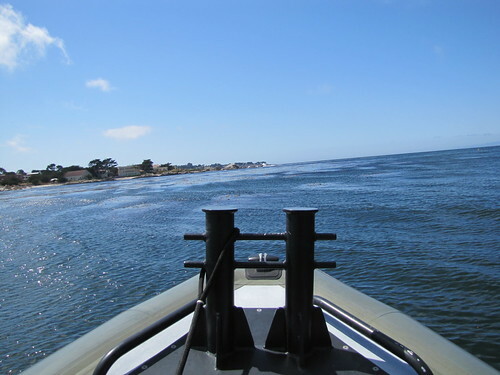 I was kicking myself for not had opted for the longer tour which takes visitors to hard-to-get-to places like Point Lobos and Elkhorn Slough. One hour tours are $60 while two and half hour tours are $140 per person. Tours can even be tailored to specific needs and interests of the group. For reservations and more information visit www.fastraft.com.